BEAUTY BOX. 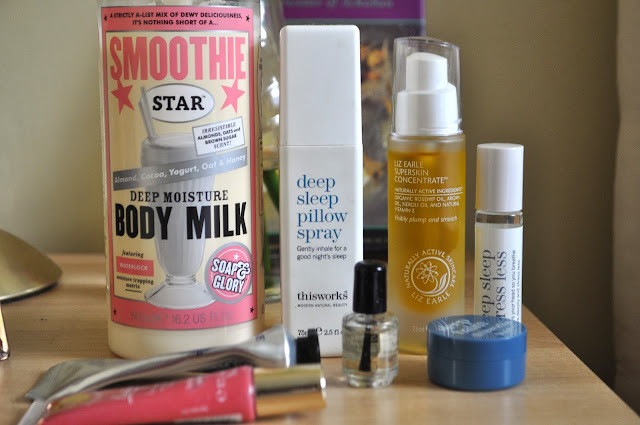 BECKI'S BEDTIME BEAUTY BOX. | Life Looks Perfect. BEAUTY BOX. 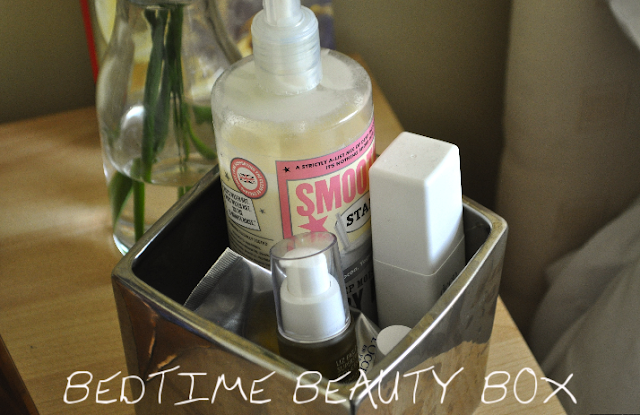 BECKI'S BEDTIME BEAUTY BOX. 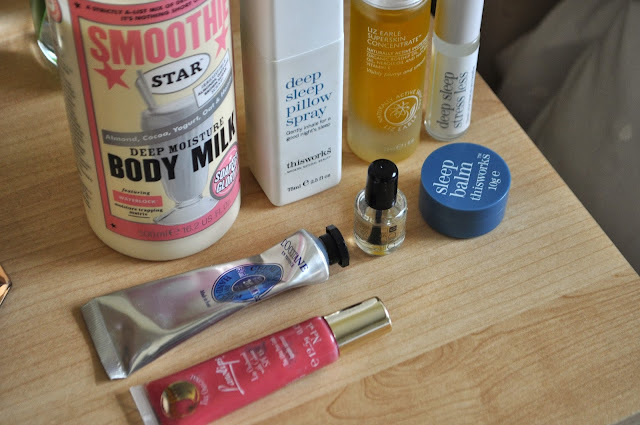 Today's beauty box is a bit of a different one. Every night I am the kinda gal that actually enjoys going to bed, mainly due to using a beautiful luxurious cleanser, indulge in a gorgeous night time oil and I am set for a perfect sleep. As I am now sharing my bedroom with John, a little compromise has had to be set in order for our space to be equal (aka for my beauty needs not to be spread around the room, covering every surface). 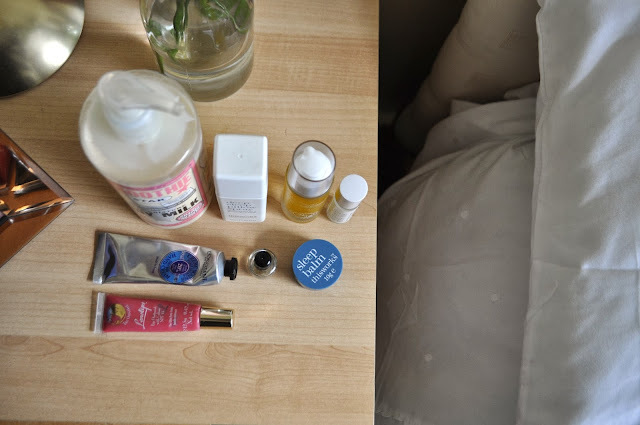 So in order to keep only the necessities out for every day use, I decided to make myself my very own Bedtime beauty Box. 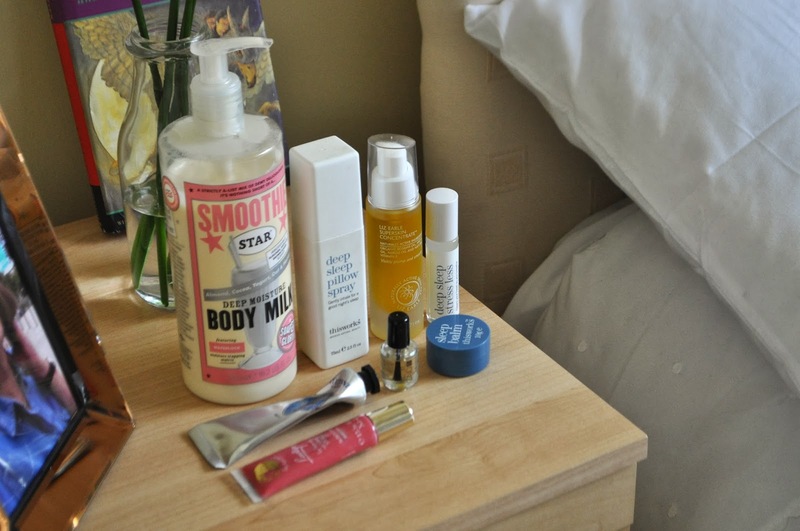 Perched on my bedside table, I keep all my favourites that I like to use just before drifting off to sleep. I like to store them in a little silver cube that I borrowed from work, which they all fit in nice and snug and I can get to them in a jiffy. First up is the mammoth Soap & Glory Smoothie Star Deep Moisturising Body Milk £10.00 500ml. Bought last Christmas, from that amazing giant Soap & Glory set from Boots, I have only recently opened this huge 500ml pump bottle, which on it's own is such a bargain at £10.00. The scent is a rich blend of almond, coconut oil, yogurt and honey and the only way I can describe the fragrance is that it smells like popcorn and biscuits! With coco butter and Shea butter, this light moisturiser leaves your skin feeling smooth and hydrated just after a few pumps. I apply this usually after I shower but also on my arms and legs before bedtime. I love this product, it feels like a little bit of luxury for my skin and the genius packaging, means it is fuss free. If you are a regular reader of LLP, you would have seen I write about this trio ALOT! They are actually my saviours and I couldn't live without them. Not only do they help calm my anxiety but when I need a damn good sleep, a spritz of Deep Pillow Spray usually does the trick. If you are interested in knowing a bit more about these three Becki MUST-haves, have a read of my full reviews HERE & HERE. Liz Earle SuperSkin Concentrate £40.50 28ml c/o. As many of us are, I have become obsessed with oils. Whether they are for night time or to use underneath your moisturiser in the day, I can't get enough. 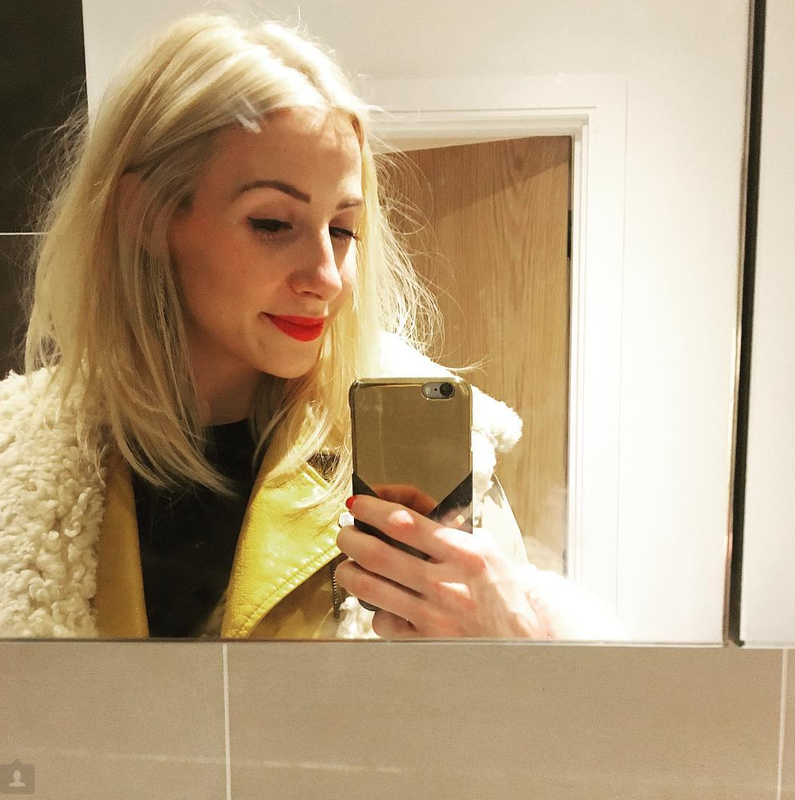 For me, face oils are one of the very few products that gives my pale skin a beautiful glow. I can really tell the difference in the morning. This luxurious SuperSkin Concentrate from Liz Earle is a rather special bottle of goodness. With 100% pure natural plant oils including organic rose hip oil and argan oil, they can help rejuvenate and re balance, smooth and plump without any residue. This concentrate has the most beautiful aroma too as it is jam packed with essential oils of neroli, lavender chamomile that helps to calm the senses. For me, I like to use the concentrate just before bedtime, after cleansing but before moisturising- perfect hydration. I have also just used this concentrate instead of moisturising, as I find the oil is just as moisturising. All you have to do is warm a few drops in your hand and massage into the skin. I use this as the perfect time to get the blood flowing and really work in the oil. Although this oil is an investment, a little goes a long way! This bottle is by far the cutest sample I have ever seen. I got the chance to try this little cuticle oil as it was one of the fantastic goodies inside the BBB Beauty Box earlier on in the year. You can read about it HERE. This oil has a tiny mini brush that is the perfect tool in applying the oil onto your nails, just like a nail varnish really. Infused with Vitamin E, this sweet marzipan smelling treat, helps to maintain strong and healthy nails. If you are like me and use way to much nail varnish remover and change your nail colour everyday then this oil is a wroth way investment. At around £11 for 15ml, I will certainly be buying this product again. I was lucky enough to bag myself one of the Latest in Beauty's fab Ultimate Summer Nail Boxes this year and this amazing hand cream was one of the products. Read my full review HERE. I have always been a huge fan of L'Occitane, with many hours spent drooling in their beautiful stores, I always find their product ranges ooze luxury. This little hand bag size hand cream in now my floristry hand saviour! As you may already know, being a florist is not glam! Yes I get to create the most incredible displays and "play" around with flowers all day but it is hard graft and boy do my hands suffer. I therefore as a blogger and beauty obsessive, take extreme care of my hands. Ever night I lather on the hand cream and let is soak in, just to help regain some moisture in them after a tough day. This hand cream is fantastic! It has got to be one of the softest, light and extremely hydrating hand creams that I have tried in a long time! Sometimes, hand creams juts feel like they sit on the skins surface, well this one feels like it soaks deep into your hands. I love it and I certainly will be putting this one on my Christmas List. This lip product is amazing but so unlike me to wear. I only say that as I have never been a lip gloss gal until I found this product. This is the beautiful fruity deep pink Lanolips Lip Ointment leaves a subtle glossy sheen over your lips, with no sticky or tacky feeling- perfect! The Ointment glides onto your lips and lasts for ages that looks lovely for day or night. I have been using this just before bed as it is super hydrating and I love the feeling of it on my lips. 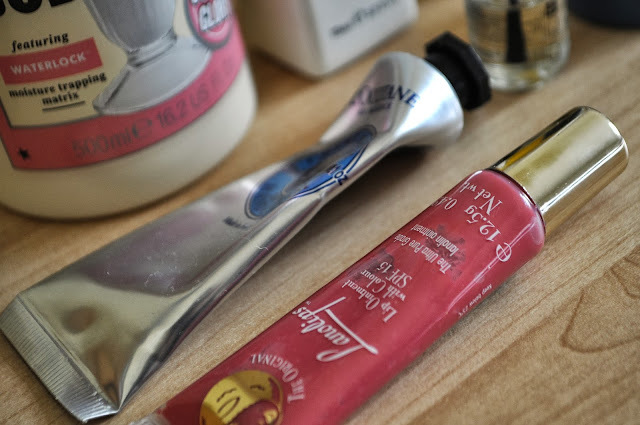 I am really interested to try more products from the Lanolips collection in the future and would recommend them to anyone who loves a glossy lip. I hope you liked my Bedtime Beauty Box. I would love to hear what beauty bits you use just before bed and if you have your very own box! Comment below or tweet me @Life_Looks. TAGS BATH AND BODY., BEAUTY BOX., SKINCARE.